In the godswood of the Red Keep, Eddard Stark meets Cersei Lannister—a simple conversation between the Hand of the King and the Queen. Yet the fallout of that conversation decides the fates of hundreds of lives and shatters the peace of the Seven Kingdoms, perhaps beyond repair. 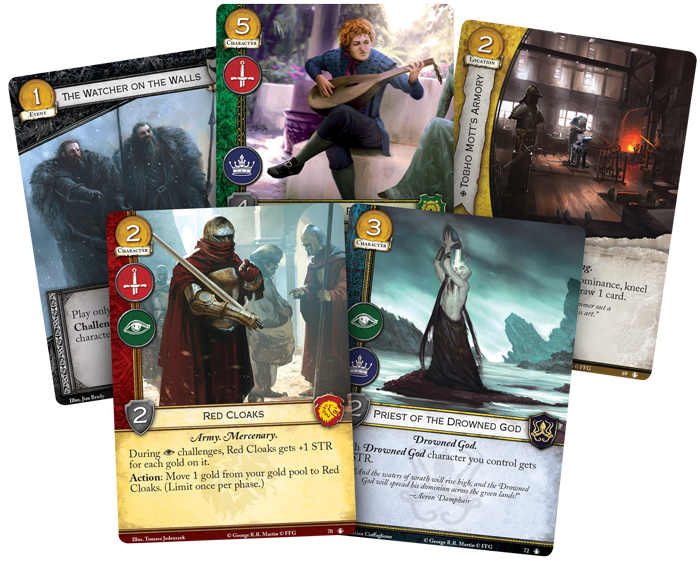 Now, you can take your place in the growing tensions that drive Westeros with No Middle Ground, a new Chapter Pack for A Game of Thrones: The Card Game that’s now available at your local United States retailer and online through our webstore! No Middle Ground continues the path of the Westeros cycle by following the main events of the first book in A Song of Ice and Fire. Here, you’ll find recognizable characters like Hodor, Halder, and Ser Horas Redwyne, each ready to fight for their chosen factions. This Chapter Pack also quickly increases the options available to every deck with five new plot cards—three loyal to their faction and two neutral. With new cards for every faction and plenty of new plots, you’ll be able to revolutionize your decks with the addition of No Middle Ground. 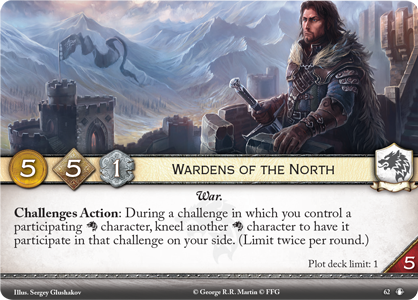 By the end of the Westeros cycle, the eight factions will each have received a loyal plot card that both typifies the faction and provides a significant boost to the faction’s other cards. No Middle Ground is unique in that it contains three of these faction-specific plots: one for the Night’s Watch, one for House Stark, and one for House Targaryen. These plots are undeniably powerful, and as we’ll see below, they may well define their factions for years to come. 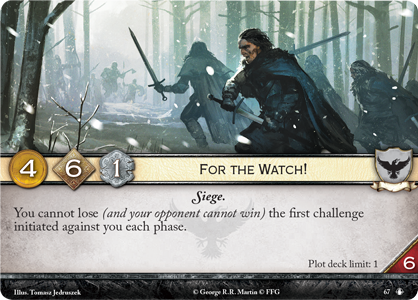 The first plot card is For the Watch! (No Middle Ground, 67), a plot that boasts a universally impressive effect. While For the Watch! is your revealed plot, you cannot lose, and your opponent cannot win, the first challenge made against you each phase. Understandably, this plot is a huge boon for the Night’s Watch. 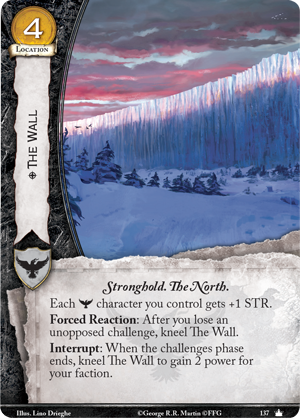 It means one less challenge that you need to defend to gain power from The Wall (Core Set, 137), while reducing your opponent’s options. 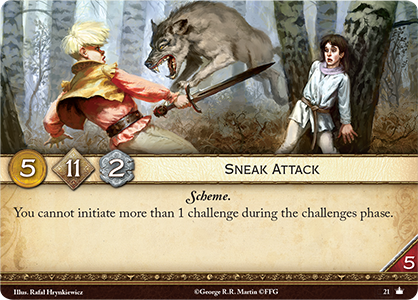 You might even be lucky enough to catch a plot like Sneak Attack (Core Set, 21), completely neutralizing your opponent’s turn. For the Watch! even breathes new life into cards like The Sword in the Darkness (Core Set, 140). Your opponent is unlikely to put much STR into a challenge that he knows he cannot win. With that in mind, it should be relatively easy for you to win by five STR, trigger The Sword in the Darkness, and prevent your opponent from making any additional challenges this round! 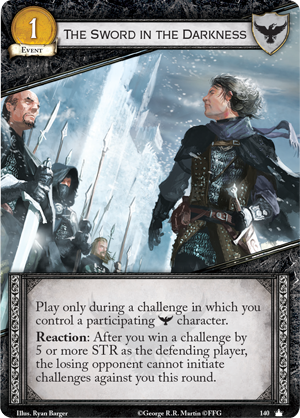 While the Night’s Watch gains a purely defensive plot, House Stark gains a plot that can make their opponent’s challenge math a pure nightmare. House Stark’s loyal plot from the Westeros cycle is Wardens of the North (No Middle Ground, 62), and it reads, “Challenges Action: During a challenge in which you control a participating Stark character, kneel another Stark character to have it participate in that challenge on your side. (Limit twice per round. 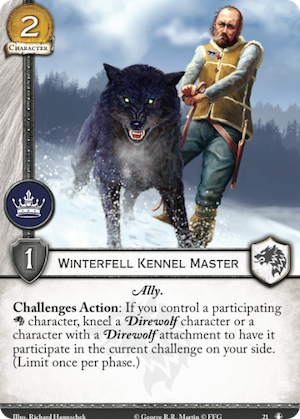 )” Not only does this allow you to suddenly bring more forces into a challenge, it bypasses the necessity to have the appropriate challenge icon, meaning even your Direwolves could participate in intrigue or power struggles. House Stark has justly established a reputation for being hard to face on the field of battle. Although they may not have many events or unexpected tricks, their sheer number of options makes it very difficult to decide how you want to make your challenges. 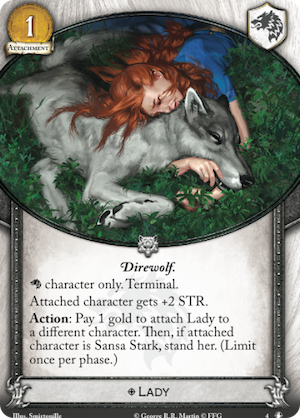 When you combine Wardens of the North with cards like Lady (Taking the Black, 4) and Winterfell Kennel Master (The Road to Winterfell, 21), battling House Stark can quickly becomes more trouble that it’s worth. 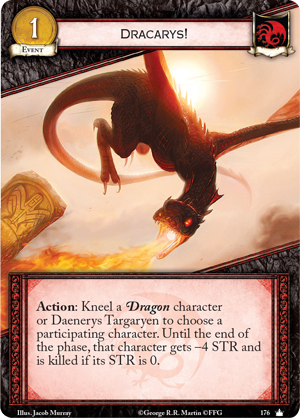 The final loyal plot in No Middle Ground is Blood of the Dragon (No Middle Ground, 75), and it directly supports one of House Targaryen’s most enduring themes: “burn,” or the process of reducing the STR of enemy characters. Though its stats are unimpressive, Blood of the Dragon can make any opponent tremble in fear—while it’s revealed, each non-Dragon character has its STR reduced and is killed if its STR is zero. 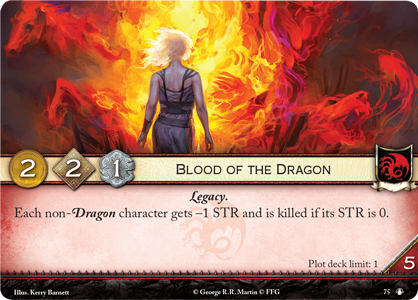 In addition to automatically killing many of the supporting, one-STR characters in the game, Blood of the Dragon combines exceptionally well with Daenerys Targaryen (Core Set, 160). 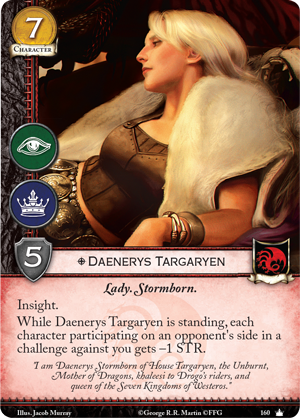 Daenerys’s global STR reduction combined with Blood of the Dragon can kill characters with two STR as soon as they enter a challenge against you. When you add that to the extra boost this plot gives cards like Dracarys! 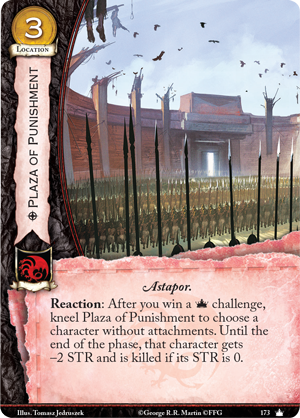 (Core Set, 176) and Plaza of Punishment (Core Set, 173), you can be sure of one thing: the fields of Westeros will burn before the onslaught of House Targaryen. Tensions in King’s Landing continue to grow, but they cannot grow forever. 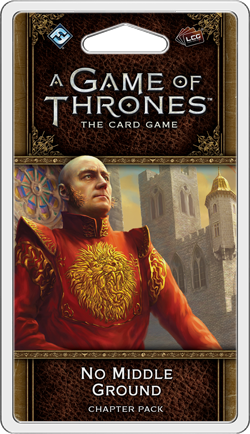 Sooner or later, they will explode, and when they do, the consequences could be dire for everyone in Westeros. It’s time for you to choose your side. Pick up your copy of No Middle Ground at your local retailer today!